Walking into the fastener section of a West Marine or your local hardware and home center can be daunting. 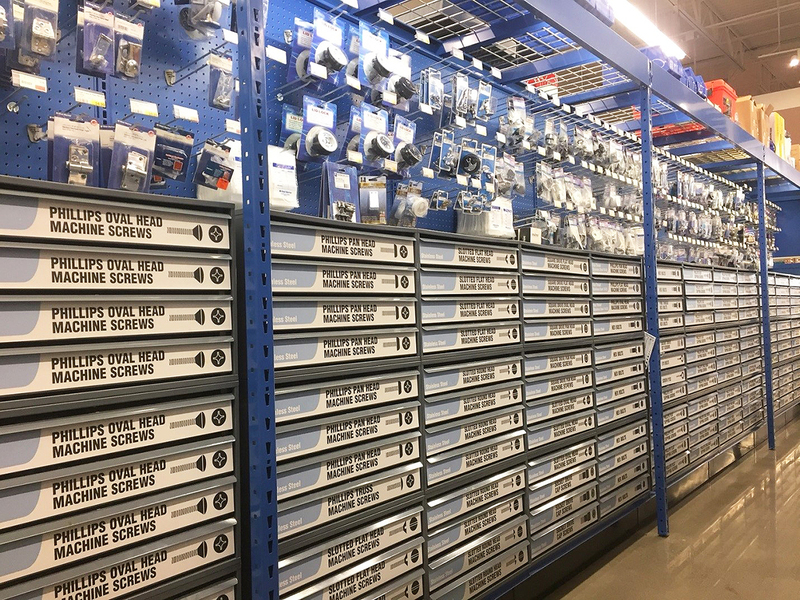 An entire aisle dedicated to nuts and bolts and screws with hundreds of drawers with a dozen compartments—each with a different screw, bolt, or nut. 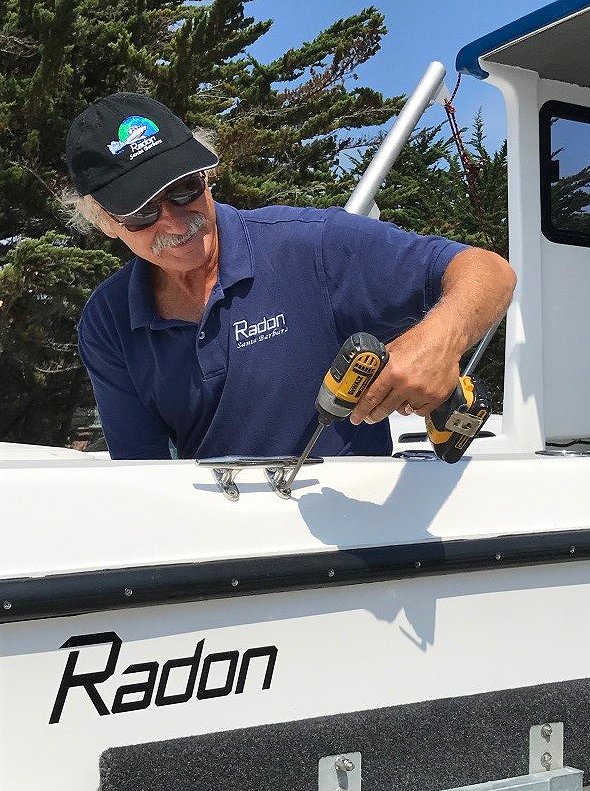 Having a working knowledge of how fasteners are identified and what type of fasteners are best for certain applications can reduce your confusion and hopefully your time in the fastener aisle so that you can get back on the water sooner. The word fastener can mean: screws, bolts, nuts, washers, nails, togglers, hanger bolts, rivets and loads more that I’m forgetting. The primary function of a fastener is to clamp two parts together. Each type of fastener has a unique shape, usually comes in a range of sizes and has its own identifying name. Some names are intuitive like flat head wood screw, hex nut, hex head bolt, and flat washer. Other with names like Escutcheon pins, castle nuts, carriage bolts or cheese head screws (no link to Wisconsin football fans—I checked) are based on a bygone era that make little sense to us in modern times. Sizing conventions are a little easier to understand and are more aligned with the modern era. Most sizes have a number designation or are referenced by their physical size (in inches or millimeters). Knowing what you are looking for by name will help rule out significant portions of the fastener aisle and streamline your efforts to gather what you need. 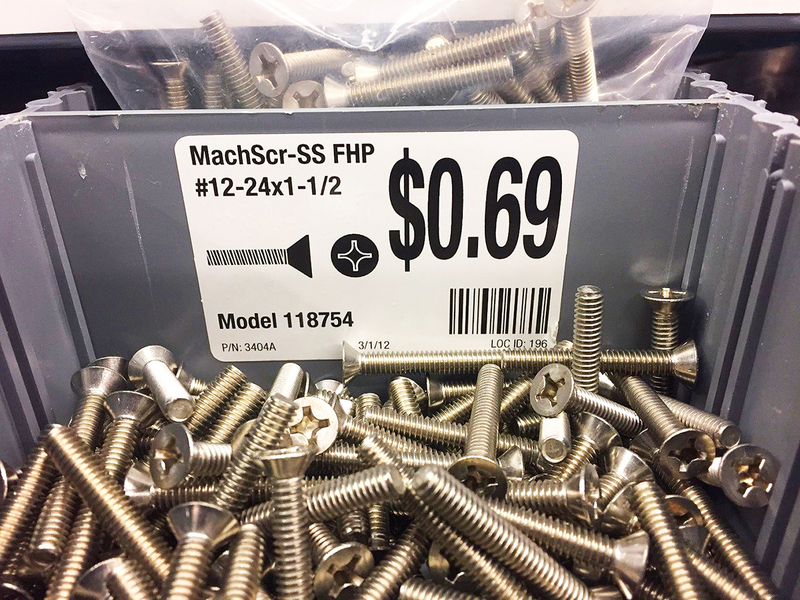 Fastener naming conventions: Fastener material usually is noted first either by how the banks of fastener bins are organized or on the package labeling itself. 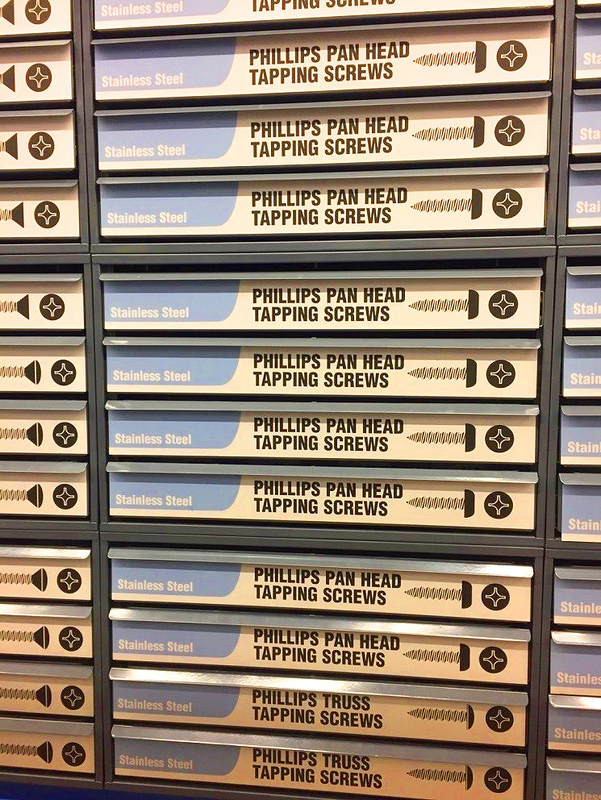 Fastener bins in our stores are typically organized by material, then type of fastener, followed by head style and drive type—all of these details are noted by a visual reference on the drawer face. Diameter, thread pitch (if applicable) and length are noted on the individual bins within the drawers. Using the bin label below you will see that these machine screws have a diameter size of #12, have a thread pitch of 24 and are 1 1/2" long. A silhouette of the screw offers a visual reference and comes in handy for smaller fasteners. This one indicates a flat head machine screw with a Phillips drive. As referenced above, this silhouette is also on the exterior of the drawer to help guide you to the right bin a little faster. Material, type of fastener, head size and drive type. Do I need an escutcheon pin or a castle nut? Which fastener is the best choice for the job? The truth is that there may be several fasteners that are right for your application. Picking one often has to do with function and aesthetics. I typically consider function first so that I can rest assured that what I set out to accomplish with a fastener goes as planned. Meaning that if I’m screwing together two pieces of hardwood and I want a tight seam with no gaps, I will select a wood screw with tapered threads with a smooth portion of shank that helps draw the pieces tightly together. If I’m though-bolting a rope clutch, I will choose a machine screw that matches the pre-drilled holes of the clutch and is long enough to provide threads for a washer and nylock nut. The aesthetic aspect comes into play more with installing hardware with exposed fasteners such as cleats, pad-eyes, and handrails. Most hardware is predrilled for installation—often for counter-sunk screws. Counter-sunk screws are typically best suited for flat head or oval head screws. Both style heads are available with Philips, square drive and slot heads. Changing the head and drive type doesn’t really change the strength or function, so pick a fastener that matches the overall look of the surrounding hardware or pick a head type that looks right to you. What type of stainless steel are these machine screws made from? When boaters gather around the dock carts and discuss the merits of using an oval head sheet metal screw vs. a flat head wood screw, the conversation almost always turns to what is the best material to use (it could happen). Chrome plated brass, bronze, stainless steel? The general consensus is that stainless steel is the best all-round fastener material. And for good reason. Stainless steel offers excellent corrosion resistance and strength at a reasonable price and there are several stainless steels from which to choose (more on this below). Bronze and plated or coated steels shouldn’t be forgotten as they do have their place in the marine environment. 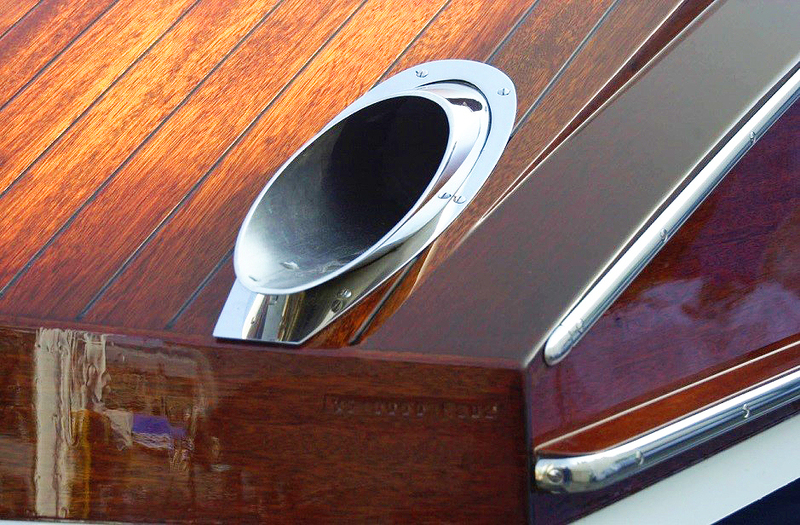 Bronze is an excellent choice for applications below the waterline because it maintains its corrosion resistance in the absence of oxygen and is often the least noble metal on a boat—which plays nicely with other materials; meaning it is not likely to galvanically react with the materials it secures or to which it is near. Coated graded steel has a greater tensile strength than stainless steel and is a better choice for shaft coupling bolts and other engine components. But apart from engine applications, stainless steel is still often the best choice for the job. Check with any instructions supplied with the hardware or equipment you are installing to find the manufacturers recommendation, if they have made any. What is the best grade of stainless steel? There are three types of stainless steel commonly used for fasteners: 18-8, 304 and 316. The easiest way to look at it is to remember: the higher the type number the higher the corrosion resistance. Meaning, 18-8 stainless steel is less corrosion resistant than 304 and 316 stainless steel offers more corrosion resistance than 304. While boaters often focus on the corrosion resistance properties, there is a cost to this extra protection: strength. Because of the alloy composition, there are differences in the tensile strengths of each type of stainless steel. To simplify it: the more corrosion resistant the fastener, the lower tensile strength. In many cases this difference is minor and opting for the more corrosion resistant material will not affect the holding power. In other cases, the choice of a weaker material can make a difference. For highly loaded hardware that is under a load which is in-line with the fasteners (a tensioned load) 304 or 18-8 or 304 stainless steel may be a better choice. As noted above, the lower tensile strength of stainless steel regardless of type would not be appropriate for shaft coupler bolts: grade 8 zinc coated bolts are the ideal choice. This deck cleat calls for a strong through-bolted installation with good-sized backing plates under the bolts. This is a common question boaters ask when installing deck hardware. Some applications are well suited to being secured by the aggressive threads of a self-tapping screw. These are usually non-critical items like Bimini and dodger frame brackets and snaps, halyard bags, cabinetry, interior hardware and decorations. Basically anything that carries a lighter load and is not something you plan to hang your life on. Through bolting is the best approach for hardware that experiences high loads such as cleats, windlasses, lifeline stanchions, pedestal guards, rope clutches, etc. Anything that is critical your safety or the boat’s function should be through bolted. That said there will be situations where through-bolting isn’t possible—the outboard fasteners on stanchion bases installed close to the edge of the deck for example. In these cases through bolting where possible and installing the largest and longest possible fastener in the rest may suffice. I’m screwing into a cored deck. Do I have to pot the fastener in epoxy? Really?The short answer is no, but (and it’s a huge but) not potting fasteners in epoxy can allow water to penetrate and compromise the core of the deck, cockpit sides or hull. Potting fasteners in epoxy means removing the deck or hull core (often balsa, foam or plywood), and filling the cavity with thickened epoxy. Once the epoxy is cured you then re-drill for the fastener and install the hardware with bedding compound. It sounds like a ton of work, but when approached methodically it goes much faster than expected—and it preserves the integrity and value of your boat. There are several pre-thickened epoxies on the market to make the process faster. Are you prepared to go back to the fastener aisle? With a working knowledge of fasteners, you can explore the intricacies to any degree you wish—be careful it’s a deep rabbit hole. There is more than one bolt, screw or nut that will get the job done. Having read the above, the take-away is that you are now armed to make more informed decisions regarding which fastener to choose from several options. And that there is a time and place for graded steel vs. stainless steel. As noted the general rule say that for the money, stainless steel is the best choice for a majority of applications—until you begin working in the engine room—then zinc plated graded steel may be a better choice. Hopefully some of the complexity of marine fasteners has been removed by the points addressed above and that your time spent in the fastener isle is reduced so that you can get back on the on the water faster and be able to contribute to that conversation around the dock carts. Wood Screws: Ideal for fastening two pieces of wood and drawing one piece toward the other. Requires pre-drilling usually with tapered drill bits. Example: securing a table top to the base. Deck Screws or Self-Tapping Screws: These have a slightly smaller diameter shank to secure wood, fiberglass, soft plastics. Pre-drilling recommended and can be accomplished with straight drill bits. Example: decking, cabinetry assembly. 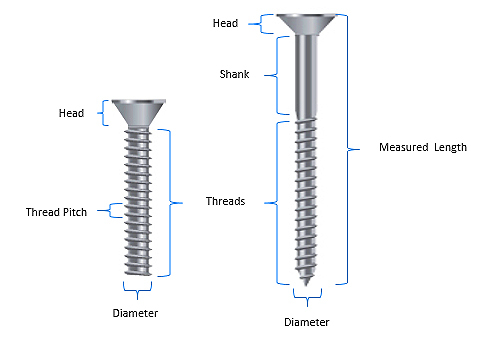 Self-Tapping/Sheet Metal Screws: General purpose coarse threaded fastener to secure wood, fiberglass, soft plastics, thin soft metals and more. Pieces should be temporarily clamped for best fit. Often does not require pre-drilling in wood and some soft plastics. Example: attaching systems brackets to bulkheads, assembling cabinetry and interior frame work, installing non-critical hardware. Set Screws: Designed to work with female cut or rolled threads to capture a part. Example: cutlass bearings in a strut, secure a door knob. Lag Screws: Often called Lag Bolts, larger screws with extra course threads and hex head. Ideal for anchoring heavy metal parts to wooden structural members. Example: motor mounts to engine stringers, brackets that support steering components. Bugle Head Screws: Like self-tapping screws with a smaller, shallower counter-sink head. Can be installed with or without a pilot hole and will sink into soft wood for a flush finish. Often referred to as decking screws. Examples: used cabinetry case construction and cleating. Socket Head Cap Screws: Machine threaded screws with a compact head that receives an Allen wrench or Torx driver. Example: access screws to cover plate of water pump impeller, portlight trim rings, bow-thruster motor mounting screws. Hex Head Bolts: Most common bolt used can be partially or fully threaded. Ideal to drawing two parts tightly together. Example: securing alternator to adjustment bracket. Allen Head Bolts: Used like the hex head bolt, but is designed to have the head fit into a socket and flush with the surface. Example: through-bolts that secure a windlass to the deck. Carriage Bolts: Clean low profile bolt head designed to “lock” into place using a square counter sunk head. Requires nut to secure. Example: wooden trailer bunk installation. U-Bolts: “U” shaped bolt with threads on either leg. Ideal for wrapping around one part to secure to another. Example: trailer parts, bow eyes. Eye Bolts: Single threaded shank with eye head. Great as a through-bolted pad eye. Example: hold down rings for coolers. Hanger Bolts: Unique fastener that combines the coarse threads of a lag bolt with the fine threads of a machine bolt. These fasteners are typically installed in wood to provide a threaded stud to secure hardware with washers and nuts. Example: motor mounts, steering system brackets. Flat Washers: Most common general purpose washer usually has similar footprint of hex head or nut. Ideal for metal parts or where loads do not require being spread over large area. Example: through bolting stanchions bases or securing rod holders to metal framework. Fender Washers: Larger cousin to the flat washer. Designed with double the surface area to spread the load over a larger area. Ideal for through-bolting hardware that carry heavy loads. Example: anchoring stand up blocks, through-bolting ladders to the flybridge. Lock Washers/Split Ring Washers: Designed to prevent bolts and nuts from vibrating loose. Ideal for applications exposed to high frequency vibrations. Example: through bolted parts on the steering pedestal or in areas close the engine. Finish Washers: Molded washer to provide a clean look to non-countersunk screws. Usually used with oval heads to create a “finished” look. Example: secures canvas panels to bulkheads, used for frequently removed access panels. Hex Nuts: Most common has six sides for general use. Ideal for general applications that are not exposed to heavy vibration. Can be used with thread locking products to resist loosening caused by vibration. 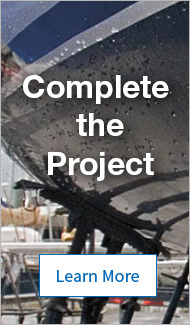 Examples: Deck hardware through-bolted installations, installing mounting brackets for equipment and motor mounts. Nyloc Nuts/Nylon Insert Lock Nuts: Thicker nut that uses a nylon ring to prevent the nut from loosening when exposed to vibrations. Professionally viewed as a one-time use. Example: Used for just about any application where you want the nut to stay tight. Barrel Nuts: Unique threaded socket with truss head. Accepts machine screws and bolts and provides a low-profile Phillips or Allen socket truss head. Example: portlight, deck hardware and installations that benefit from a low profile head. Castle Nuts: Hex nuts with a series of slots cut into one side to allow cotter pins or wire to lock the nut in place and prevent it from turning. Example: prop nuts. Tee Nuts: Threaded insert that installs from the back of a panel and locks into place with integrated teeth. These nuts are used when access for a nut and washer are limited or for applications that require a completely flush installation. Example: hardware mounted to pedestals, mounting brackets for safety and other equipment and engine cover latches. Wing Nuts: Nuts designed to be hand-tightened using two small tabs cast into the nut. Typically wig nuts are viewed as being inadequate for many marine applications because they are more prone to loosen. Examples: electronics mounting brackets, adjustable equipment such as interior lighting, supports for lockers and nav station tops, portlight dogs. Cap Nuts: Also called acorn nuts due to their shape. These nuts are commonly used to give a finished look to installations and isolate the sharp end of machine screws and bolts. Using cap nuts often requires cutting excess threads to allow it to tighten properly. Example: Deck hardware installations without headliner to cover fasteners, brackets through-bolted to lockers and bulkheads shared by other equipment. Brads: Thin finish nail to fasten wood or plywood components. Normally used for light trim work or to hold a part in place while an adhesive cures. Ring Shank Nails: Large headed nail with ribs cut into the shank. The ribs provide excellent holding power which makes removing these nails difficult—the head breaks off before the shank releases from the wood. Example: upholstery, copper sheathing, canvas waterproofing (traditional construction) and some interior cabinetry. Escutcheon Pins: Small finish nail designed to leave the head exposed for an accent. Example: wooden accessory racks, interior trim.